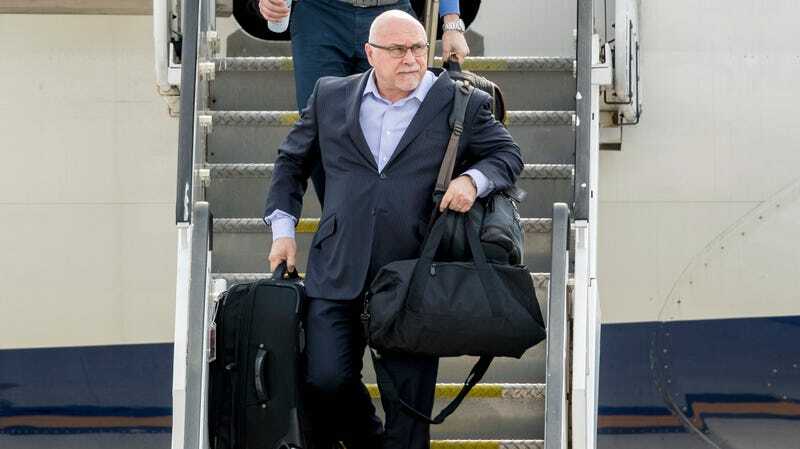 With all the other NHL coaching vacancies filled before he announced he was leaving the Stanley Cup champion Washington Capitals, Barry Trotz could really only choose between a year off from the bench or the New York Islanders. Today, he decided to go with NYC’s little-brother hockey team, signing a deal with the Islanders that put him among the top-five highest paid coaches in the NHL. Like every move the Islanders have made over the past year or so—including dumping GM Garth Snow for Lou Lamoriello earlier this offseason and locking down Josh Bailey—this new hire was done with an eye on keeping star center and potential franchise savior John Tavares playing in Brooklyn for the long-term future. Trotz will inherit a team that’s been stuck in the same kind of neutral gear that plagued the Capitals for so long, but also a group with far less talent, especially if Tavares ditches them in free agency this offseason. While the Capitals’ boogeyman lived in the second round of the playoffs, simply getting that far in his first New York season would be a success for Trotz. The Islanders have been bogged down by underachieving rosters and front-office blunders, and have only won one playoff series since 1994. And that’s why there’s a seemingly irrational amount of faith and hope placed in Tavares, the 27-year-old captain who’s scored at least 20 goals for the team in all nine of his seasons. Tavares is the best Islander since the group that won four straight Cups in the early ’80s, and for that reason, he can pretty much choose wherever he wants to play. He’ll likely be the highest-paid player in the NHL after he signs his contract this summer, which means the Islanders are going to do every little thing they can get to paint themselves as the most appealing team to sign a long-term contract with. From a roster standpoint, however, they might actually have some sort of a case. While they gave up more goals than anyone else in the league last season, and goaltender Jaroslav Halak can’t be long for the starting role, the defensive pair of Adam Pelech and Ryan Pulock are at least interesting young guys with some potential. But if he stays, Tavares would be surrounded by some legitimate offensive firepower. The Islanders have a 40-goal scorer in Anders Lee, and another strong winger in Jordan Eberle, who got traded away from Edmonton in 2017 so obviously he must have some great seasons left in him. Most importantly, they have the exciting 21-year-old Mathew Barzal, who led the team in points in his first full season and earned Rookie of the Year honors for it. That may not compare with the best teams in the NHL, but it’s at least the start of a rebuild. If there’s a problem that the Islanders have with their sales pitch, it’s probably that playing for them just doesn’t seem all that invigorating. Aside from the consistent losing (Tavares hasn’t even been alive to see them win their division), they’re stuck for now at the Barclays Center, which isn’t built for hockey and sticks them in the shadow of the Rangers and far away from their more devoted Long Island fanbase. But Lou Lamoriello, a Hockey Hall of Famer, and Trotz, still riding high on his championship, give the Islanders at least a sheen of respectability, and that might be enough to offset the gloomy clouds hovering above the franchise. No other team can offer the mentorship of the man who just coached Alex Ovechkin to the happiest moment of his life, and Trotz could very well be the asset that sways Tavares. But if the gambit doesn’t pay off, and Tavares goes elsewhere, the Islanders are going to be stuck with a very expensive coach doomed to yell at a bunch of abandoned sidekicks.